Black Sails is a story that mixes fact and fiction. Characters from Robert Louis Stevenson’s popular adventure novel Treasure Island intermix with real historical pirates like Anne Bonny and Jack Rackham. Next season, Black Sails will be adding a notorious pirate from English history into the mix. Edward Teach, the pirate most commonly referred to as Blackbeard, will appear in the third season of Starz’s epic drama. You can check him out, below. 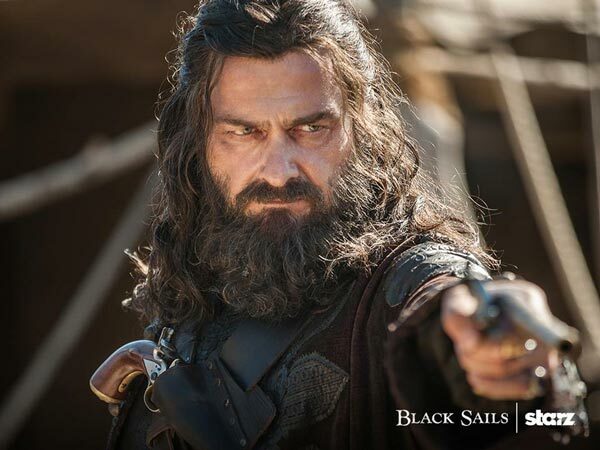 If you don’t recognize him right away, the actor playing Blackbeard is Ray Stevenson, who recently popped up in Insurgent playing faction leader and Four’s father, Marcus. He’s also recently taken roles in The Three Musketeers, the Thor movies and Dexter, although he’s most notable for starring in HBO’s drama Rome. Now he can add another subscription cable series to his resume. There's something about a Stevenson signing on to the drama that's pretty poetic. In Season 3 of Black Sails he will head to Nassau, only to find the place very much changed since the last time he visited. It seems as if Blackbeard will have a pretty big role, as Starz’s official release note the character will “disrupt cemented alliances and challenge new one.” I’d say it’s a lost opportunity if Blackbeard doesn’t make a big mark on the pirate drama, but Black Sails enjoys the unexpected, as we saw when Ned Low entered the plot during the show’s second season. Season 2 of Black Sails is currently airing on the channel. This weekend’s penultimate episode was a violent affair, filled with plenty of twists and turns. It’s difficult to see how the show will be able to tie up loose ends during this week’s finale, but Starz could totally leave a few plot threads dangling, should the subscription cable network wish to. That’s because the network already renewed Black Sails for a third season, well ahead of the Season 2 premiere (which is similar to how the show handled it’s Season 2 renewal). The series is already in production for its third season, although that season will not hit the schedule until 2016. In the meantime, along with the new image, Starz has released a behind-the-scenes teaser for Black Sails, which also features a look at the infamous Blackbeard. Brief spoilers in this paragraph because I can’t help myself. I can’t wait for Season 3 of Black Sails, but more importantly, I can’t wait to see where Black Sails is going now that Captain Flint has been hardened by Amanda Barlow’s death. To find out where the series is going before Blackbeard enters the picture, tune in to Starz on Saturday night at 9 p.m. ET.